It often strikes me as lamentable that many people think they’re in it to fight and win a war, always waiting for the grand slam or the Hail Mary pass as opposed to seeing that the significant, lasting gains are to be made on the ground, muddy step-by-step, tackling one small skirmish at a time and then coming back tomorrow to do it all over again. (It can be monotonous, yes, but daily life doesn’t have many cliffhanger endings or theme music.) In academia this often means serving on lots of committees, dealing with paper jams in the photocopier, hearing knocks on your office door at what may seem like an inopportune time, and identifying yet another split infinitive in a student essay. But given the number of people who would gladly change places with us, to be saddled with just these problems — you know, those who are on the job market now, those who have Ph.D.s and have not been lucky enough (and yes, dumb luck has a huge amount to do with it, no matter how qualified you think you are) to land a tenure-track job or to get promoted and tenured, or to get a job in a Department where people respect each other (whether they all agree or not) — well…, it seems just a little self-indulgent to complain about having to contribute to the wider conditions that make our own paycheck possible, no? It’s akin to complaining about all the time you spend writing letters of reference for students when you’re in a position because of the letters others — who were no less busy then than you are now — wrote on your behalf long ago. Or maybe somewhat like complaining about all the committee work you’re doing once tenured and promoted while not recognizing that your own career progress was on the backs of people working on your own tenure and promotion committee…. And to think that professors today complain about their students’ sense of entitlement. If they’re paying attention to us in class then it seems that they come by it honestly. I’ve long been perplexed by senior colleagues who lament that their work hasn’t had the effect that they had once hoped. I’m perplexed because, from where we sit, such grand narratives overlook the very real impact such people have in fact had in the lives and careers of those students whom they’ve taught and trained, regardless what those students have gone on to do. While I’ve certainly had designs of my own concerning how the academic study of religion ought to be carried out, it has also been evident to me that, regardless how my writings are or are not read by people I’ll never meet, I have the incredible luxury to have a group of inquisitive human beings meet with me in person several times per week, a group who, while not agreeing with everything I say, are at least willing to give me a hearing. If the seemingly non-scholarly service we do to make our own institutions run also helps to make that classroom space possible, then I’d say that fixing that paper jam, making some flyers for a student event, serving on search or tenure or curriculum committees, and coming up with a few measurable outcomes once in a while is a pretty good investment of my time. Does higher education work as I wish it did right now? No. Do I wish that taxpayers and governments thought investing in education was among their highest priorities? Yes. Do I think that the institutions in which university professors work are somehow unique and it is a workers paradise elsewhere? Of course not. But unlike the jobs my own father had (e.g., working in a factory, driving a dump truck, delivering milk door-to-door with a horse and wagon, mopping floors as a high school janitor, and pumping gas — rain or shine), I don’t get blisters doing my job and it’s cool in the summer and warm in the winter. So there’s really not much to complain about. This entry was posted in Faculty Blog, Relevance of Humanities, Religion in Culture and tagged Associate Professors, Dissatisfaction, Entitled, entitlement, Service, teaching, The Chronicle of Higher Education by Russell McCutcheon. Bookmark the permalink. Aside: what’s with all the Ms. this and Ms. that in an article when making mention of female scholars with Ph.D.s? It’s standard practice for all Chronicle of Higher Ed posts to address everyone as Mr. or Ms. regardless of rank. There are often debates about it on the Chronicle site. 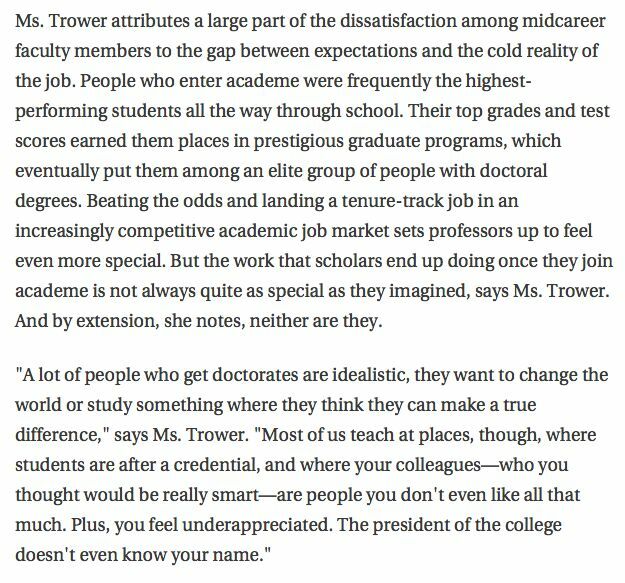 I think they think it’s supposed to be egalitarian, not identifying people by rank so that assistant profs are on the same level as university presidents, but I think it’s ridiculous. 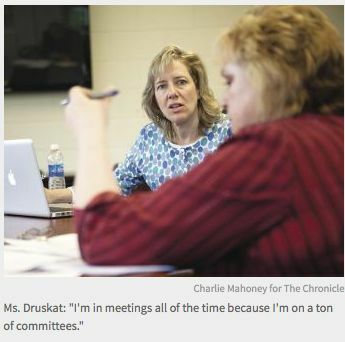 Almost everyone in Chronicle stories, except those in a field where a MFA is a terminal degree, has a PhD, so they could just call everyone Dr. instead, which would respect the years of schooling we go through while still addressing everyone by the same title. So often the stories are about rank though–as this one about associates is–so there’s no justification for their policy. Each time it’s brought up though they stubbornly insist they will not change their policy.